I’ve been waiting for this weekend since about this same time one year ago. Why, you ask? If you didn’t, I’ll tell you anyway. 🙂 It’s my second NCW writer’s conference, and it’s less than three days away. The first one gave me so much – ideas, motivation, inspiration, new writing friends, and time to re-evaluate the direction I wanted to take my writing. And, yes, it forced me to get out of my comfort zone which is my study with my computer and books, and to socialize with the other living, breathing beings. By the time we all left the hotel at the end of the conference, our eyes were bulging, and our brains were jumbled, wires misfiring, from so much information being fed into it. But what beautiful sparks those misfires created! 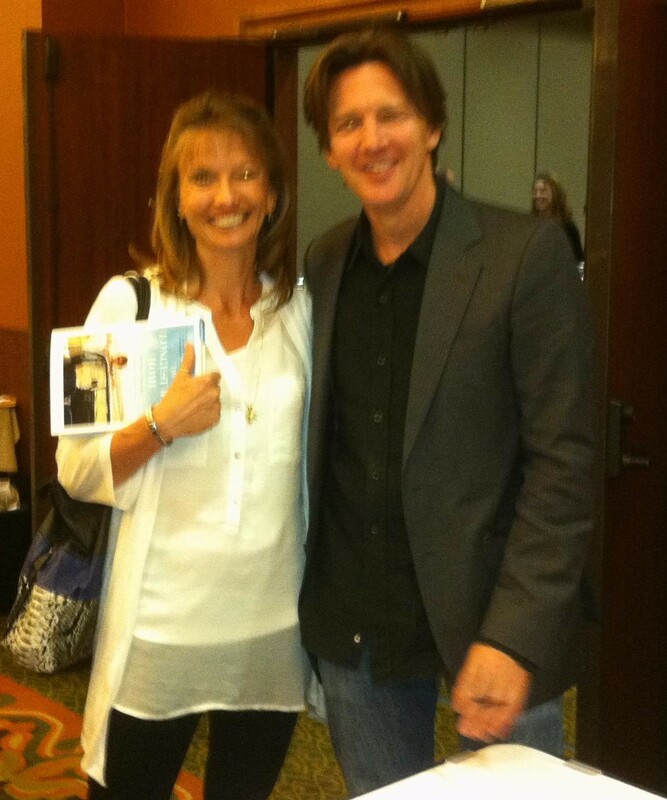 Oh, and I can’t forget to mention the first one brought me close to none other than Andrew McCarthy. (Think Pretty in Pink, St. Elmo’s Fire, Weekend at Bernie’s, Mannequin…) I have to admit when he talked to me I was dumbfounded and speechless. And I’m quick to say my husband would tell you that simply does not happen often. Here we are, a little bit blurry, as I believe the person taking the picture with my phone was likely as giddy with “teenage heartthrob-itis” as I was, but here we are nonetheless. Uh-Hm…back on topic – Andrew is not only an actor but an amazing award-winning travel writer, and was at the conference as our keynote speaker. Not only did he entertain, he taught me what writing can do to and for a person. It can lead us on a journey one never wants to return from. A journey of self-discovery, hope, pleasure, and even the greatest pain. And yet, a writer can’t help but write. It’s what we do. It’s what makes us complete. As insane as it can make us, it’s also what keeps us sane. So “all my bags are packed, I’m ready to go”… Oh, wait–that’s John Denver, and he took a jet plane. I’ll just hop in my car and head to writer’s heaven. And to listen to Chuck Sambuchino teach me from his infinite writer’s wisdom the scoop on literary agents, humor, and anything else my sponge brain can absorb. where is it located? Enjoy yourself! !